Display the information your travelers need: arrivals, departures, or both. For clarity, full city names are included – no confusing abbreviations here. Pixel-perfect & updated regularly, our robust library of airline logos is unrivaled. Flight numbers are paired with airline logos, creating an intuitive interface. The official posted flight schedules – direct from the airlines and airports. Before leaving your property, viewers know which part of the airport to head towards. 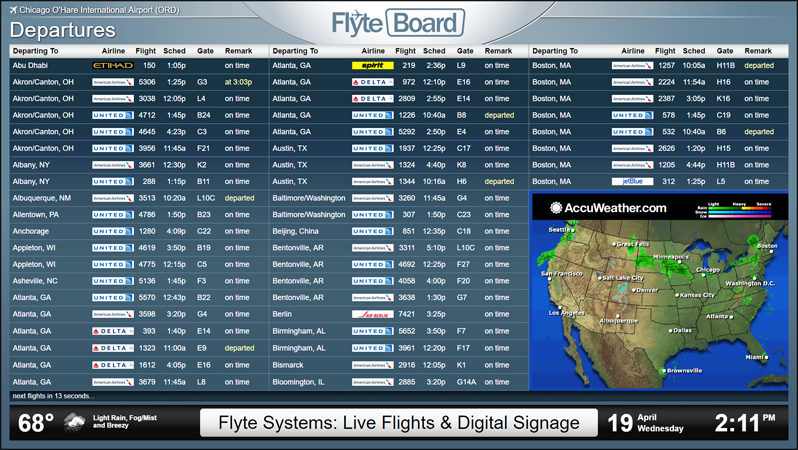 Provides immediate notification of flight status changes in real-time. For cities served by more than one, multiple airports are displayed together. Featuring your logo & company message, FlyteBoard blends seamlessly into your brand. Colorful, location-based weather updates provide even greater value to your travelers. Date & time are displayed prominently so viewers can confirm travel plans with ease. Performance is monitored 24/7, ensuring your traveling guests are consistently informed. We are proud to be the trusted provider of flight information for hotels, convention centers, corporate headquarters, training centers, parking facilities, passenger terminals, and numerous other businesses catering to air travelers. Contact us today to learn more about how FlyteBoard can boost customer satisfaction, improve productivity, and generate revenue at your location.